Andre Bernard Tippett (born December 27, 1959) is a former American football player who was an All-Pro linebacker in the National Football League (NFL) for 11 seasons from 1982 to 1993, missing all of the 1989 season. He played college football for the University of Iowa, where he was recognized as a consensus All-American in 1981. A second-round pick in the 1982 NFL Draft, Tippett played professionally for the New England Patriots for his entire pro career. Currently,[when?] he is the Patriots' executive director of community affairs. He was enshrined in the Pro Football Hall of Fame in 2008. Tippett was born in Birmingham, Alabama. He attended Barringer High School in Newark, New Jersey. He first attended college and played football at Ellsworth Community College in Iowa Falls in 1978. He is married to Rhonda Tippett (née Kenney) with three daughters, Janea Tippett, Asia Barnes, and Madison, and one son, Coby. Andre Tippett is Jewish; a former Baptist, he converted to Judaism. He currently lives in Sharon, Massachusetts, and is a Pop Warner football coach. Tippett has also studied martial arts for over three decades. He holds a sixth degree blackbelt in Uechi-ryu karate, and is certified under the Okinawa Karate-do Association based in Okinawa, Japan. He currently serves as the Executive Director of Community Affairs for the New England Patriots. Tippett was an All-American defensive end and a three-year letterman at the University of Iowa. He was also a two-time All-Big Ten selection (1980 and 1981). In 1981, he helped lead the Hawkeyes to their first winning season, their first Big Ten title, and first Rose Bowl in two decades. He was part of a defense that allowed only 129 points, the lowest total since 1965 and 9th-best in school history and allowed only 86.9 rushing yards a game, which still stands as the school record. The 1981 Iowa defense allowed 253 total yards a game, the fewest since 1959, making it the 4th-best defense in school history in terms of total yards. Against Northwestern on October 3, 1981, the Hawkeye defense allowed 78 total yards which stands as 6th-best in defensive performances in team history. — Jets fullback Roger Vick, ranking the NFL's best pass rushers during the 1988 season. 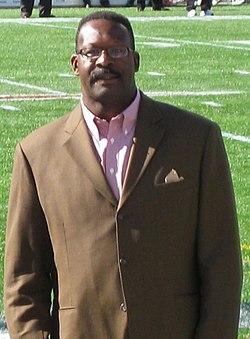 Tippett was drafted by the New England Patriots in the 2nd round of the 1982 NFL Draft. Tippett is a member of the NFL’s 1980s all-decade team and was selected to five Pro Bowls in his career, earning the nod in five straight seasons from 1984–88. From 1984–85, Tippett recorded the highest two-season sack total by a linebacker in NFL history, totaling 35.0 sacks during the two seasons. His 18.5 sacks in 1984 are the third most by any linebacker in a single season, while his 16.5 sacks in 1985 are tied for the sixth most by any linebacker in NFL history. Tippett holds the Patriots’ franchise record with 100.0 career sacks. He also owns the top three single-season sack performances in Patriots history (18.5 in 1984, 16.5 in 1985 and 12.5 in 1987). He ranked seventh on the all-time sacks list, and third among linebackers, at the time of his retirement following the 1993 season. Over his career, Tippett recorded 100 sacks in 151 games, an average of 0.662 sacks per game. The mark currently ranks fourth in NFL history among linebackers. After not recording a sack as a rookie in 1982, Tippett finished either first or second on the team in sacks in each of his final 10 seasons. He led the team in sacks six times and finished second on the team four times. Tippett recorded 30 multiple-sack games in his career and sacked a total of 41 different quarterbacks. Tippett recovered 18 opponents’ fumbles during his career, tying him for first on the Patriots’ all-time list (Steve Nelson). He also forced 17 fumbles in his career. Tippett was named the AFC’s Linebacker of the Year by the NFL Players Association for three straight seasons from 1985–87. He was voted to the Associated Press All-NFL First-team on two occasions (1985 and 1987) and Second-team on two other occasions (1986 and 1988). He was also named to the NFL Films All-Pro team in 1984. He was voted the Newspaper Enterprise Association (NEA) co-Defensive Player of the Year (with Raider Howie Long) in 1985. Additionally, he was voted the 1985 UPI AFL-AFC Defensive Player of the Year. Tippett spent his entire 11-year career with the Patriots and was a member of three playoff teams, including the 1985 AFC Champions. Tippett was selected to the Patriots’ 35th Anniversary Team in 1994 and was selected to the Patriots Team of the Century in 2000. He was inducted into the New England Patriots Hall of Fame in 1999. Tippett was inducted into the University of Iowa Hall of Fame on September 7, 2007. In January 2008, he was voted by a panel of former NFL players and coaches to Pro Football Weekly's All-Time 3–4 defensive team along with Harry Carson, Lawrence Taylor, Randy Gradishar, Howie Long, Lee Roy Selmon, and Curley Culp. He was named as one of 17 finalists for the Pro Football Hall of Fame’s Class of 2007 and 2008. As a finalist he joined other modern-era players and two players selected by the Hall of Fame’s Senior Committee in the pool from which the Hall of Fame class was selected. He was selected to the Pro Football Hall of Fame for the class of 2008. Tippett was inducted into the National Jewish Sports Hall of Fame in April 2009. In May 2012, he was inducted into the Alabama Sports Hall of Fame. ^ "THE ULTIMATE NEW JERSEY HIGH SCHOOL YEARBOOK: T-Z AND ALSO...", The Star-Ledger, June 27, 1999. Accessed August 4, 2007. ^ "The Converted Linebacker". Jewishsports.com. Archived from the original on October 14, 2008. Retrieved November 28, 2008. ^ "Sharon Pop Warner Rosters". sharonpopwarner.com. Archived from the original on August 29, 2010. Retrieved January 30, 2012. ^ "Tippett Andre | Bio of Tippett Andre | AEI Speakers Bureau". www.aeispeakers.com. Retrieved February 6, 2017. ^ "Okinawan Karate Club - Staff". www.stoughtondojo.com. Retrieved June 25, 2017. ^ "Second Act: Andre Tippett finds serenity in karate". NFL.com. Retrieved June 25, 2017. ^ "Andre Tippett". New England Patriots. March 9, 2015. Archived from the original on February 7, 2017. Retrieved February 6, 2017. ^ "2007 University of Iowa Football Media Guide" (PDF). July 22, 2008. Archived (PDF) from the original on December 9, 2008. Retrieved November 28, 2008. ^ "Fry's confidence in Tippett pays big dividends". Hawkeyesports.cstv.com. August 7, 2007. Retrieved November 28, 2008. ^ "56 Andre Tippett LB". Patriots Official website. Archived from the original on November 15, 2009. Retrieved November 28, 2008. ^ "Cris Carter, Darrell Green finalists for Hall of Fame". USA Today website. January 15, 2008. Retrieved November 28, 2008. ^ "Tippett for HOF website". Andre4hof.com. Archived from the original on May 7, 2008. Retrieved November 28, 2008. ^ "Redskins' Green, Monk headline HOF class; Tagliabue shut out again". Sports.espn.go.com. Associated Press. February 2, 2008. Retrieved November 28, 2008. ^ "Honor for Andre Tippett – Reiss' Pieces". Boston Globe. February 12, 2009. Archived from the original on February 15, 2009. Retrieved February 12, 2009.